We get a lot of requests for various gemstone engagement rings. One of the most popular gemstones for use in an engagement ring is blue sapphire. This gem shows magnificently in any piece of jewellery. Paired with the proper ring style, it can be a real show stopper. Blue sapphire also looks great in fashion rings, pendants, eternity bands and a vast array of other jewellery. The striking colour of the gem draws the eye with mystery and intrigue. Sapphire is a gemstone belonging to the corundum family. It comes in many colours like yellow, pink, white, blue and orange. Sapphire cannot be red as red in the corundum family is classified as ruby. The large array of colours makes sapphire a really great gemstone in terms of versatility. It is a stone that can be used in the design of many pieces with many different and original design elements. Sapphire measures 9 and the Mohs hardness scale. To put things into perspective, diamond has the highest measure of 10. The remarkable strength of sapphire makes it a good choice for many styles of jewellery. Jewellery is usually worn on a daily, weekly or monthly basis. This means it is subject to a large amount of wear and tear. The constant scraping and rubbing can ruin some gems in very quick order. 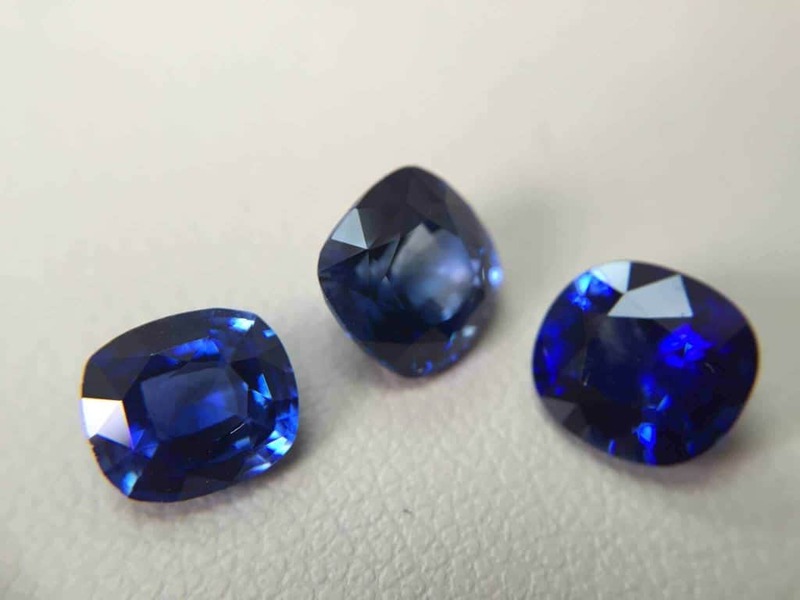 Since sapphire is high on the hardness scale, it will not wear or scratch very easily. It will be able to withstand most normal abuse. Normal being the optimal wording. No gem or diamond can absorb the impact of being slammed with a hammer with enough force. This is always good to keep in mind when wearing any type of jewellery. Sapphire is a great choice for gemstone engagement rings because it is stronger then other gemstone material. Choosing the style of your sapphire engagement ring is a very personal thing. There are a variety of styles, but there is one that stands out to us as the number one choice: the halo sapphire engagement ring. This style, made popular by the British Royal Family, has a long and highly desirable history. 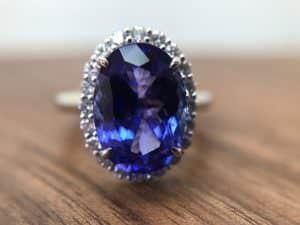 Princess Diana’s engagement ring was a 12 carat oval shaped blue sapphire with a diamond halo set in 18 karat white gold. The small white diamonds surrounding the centre stone made the centre sapphire look more prominent and striking. The added detail also created a level of style and elegance. The ring is now in the possession of Catherine Middleton, Duchess of Cambridge, as Prince William, Duke of Cambridge, proposed to her with this ring in 2010. This caused in increase once again in the popularity of this engagement ring style. Sapphire is a very versatile gemstone that should not be overlooked when deciding on the look of your future engagement ring. It is hard, durable and comes in a wide range of stunning colours. Sapphire is great for many styles of jewellery and we would love to help you style your ideal piece! Call or email us to discuss your ideas in person and in more detail! Jacob Mercari is a jeweller based in downtown Toronto specializing in custom jewellery, diamonds & gemstones of all shapes and sizes. We love meeting with new people and helping create the perfect piece of jewellery.